Previously a powerful magical girl known as Queen Karma, Morgana was renouned across demon slaying magical girl circles for her ability to harness karmic energies and turn them into energy and weapons to use against the demons she fought. 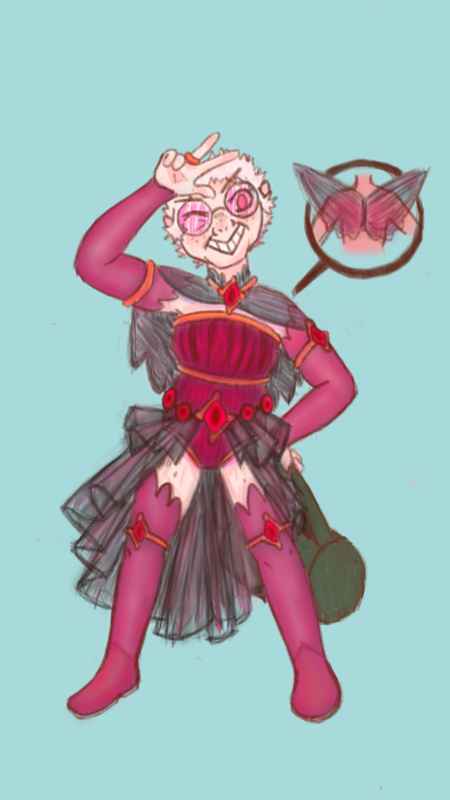 Unfortunately, now shes known across magical girl circles for being a criminal and a nutcase, after she went on a crime spree for the sake of harvesting bad karma to become more powerful, and her magical girl status and magic abilities were revoked by the council of magical girls. Today, her lack of an official status doesnt seem to bother Morgana too much. Using a bunch of stolen power crystals to access her powers, Morgana continues to both take part in an absolutely ridiculous amount of crimes and protect the public from demonic threats, and has an absolute blast doing so. Unable to store the magic she harnesses from her activities, she immediately dumps all enegy she generates into making magic items, and has accumulated a large arsenal, which she keeps in her enchanted duffle bag. These weapons have been invaluable to her ability to engage in combat with both demons and rival gangs encroaching on her turf. Also invaluable to her is her proficiency in deceit and trickery and absolute lack of fucks to give about anyone or anything. Recently, her resumed activities have been brought to the attention of the magical girl council, and morgana knows that its only a matter of time before they do something about her, though shes not all that worried, given that shes finally found someone as violent and possibly crazy as her to team up with.